China Speed Controller manufacturer (ASCDA-N) - Wuxi AFL Flow Controls Equipment E/I Co. Ltd.
AFL Group is a speed controller manufacturer and speed controller exporter in China. The ACHEM Pneumatic Actuator Speed Controller was designed with an advanced throttling technology that was made specifically for the use of controlling the opening and closing speeds of pneumatic actuators. The ACHEM Pneumatic Actuator Speed Controller can be mounted directly to Pneumatic Actuators or used with Solenoid Valves and/or Positioners. 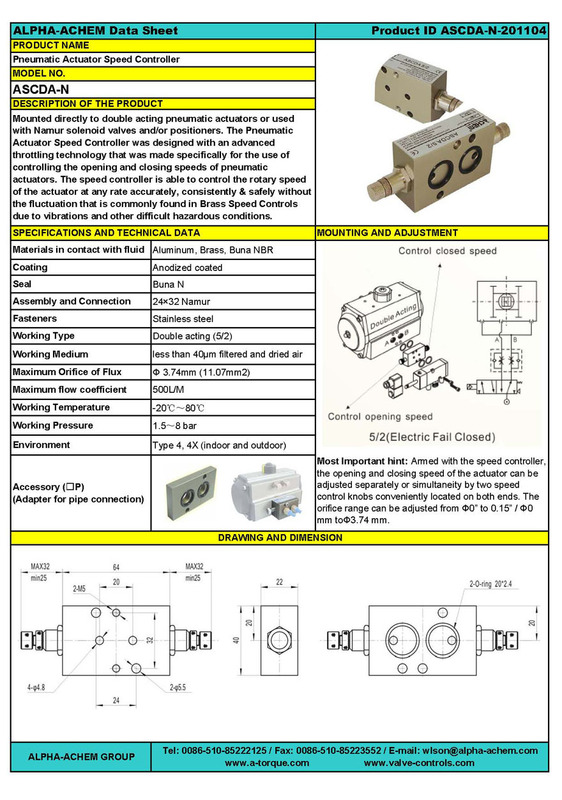 The ACHEM Pneumatic Actuator Speed Controller controls the rotary speed of the actuator at any rate accurately, consistently & safely without the fluctuation that is commonly found in Brass Speed Controls due to vibrations and other difficult hazardous conditions. - Working Medium: Filtered and dried air (Less than 40 um). - Individual & Dual Controls: The opening and closing speed of the actuator can be adjusted separately or simultaneity by two speed control knobs conveniently located on both ends. The orifice range can be adjusted from Φ0” to 0.15” / 0 mm toΦ3.74 mm. - Assembly: Directly Mounts between the actuator and Namur solenoid valve (5/2 or 3/2). - With the use of an ASC adaptor, the speed control unit can be connected directly to 1/4” pipe connections.